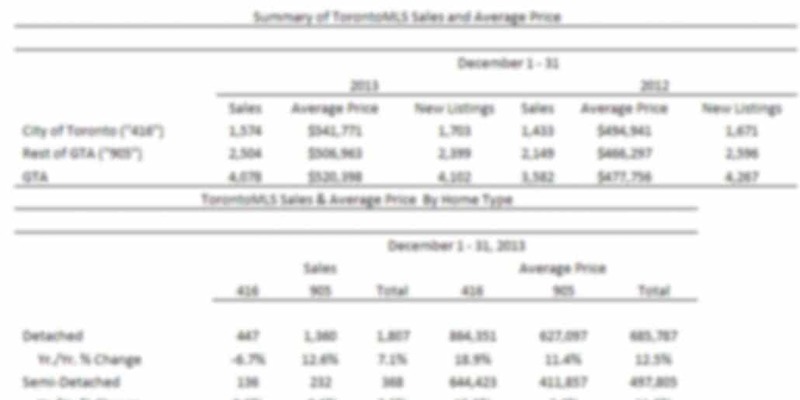 TORONTO, January 6, 2014 — Greater Toronto Area REALTORS® reported 4,078 residential transactions through the TorontoMLS system in December 2013 – up by almost 14 per cent compared to 3,582 sales reported in December 2012. New listings entered into the TorontoMLS system were down by almost four per cent over the same period. Total sales for calendar year 2013, at 87,111, were up by approximately two per cent compared to 85,496 transactions in calendar year 2012. “After a slow start to the year, sales growth accelerated to a brisk pace in the second half of 2013. Despite the inclement weather in December, we finished the year with a respectable gain in transactions compared to 2012. Looking forward, I believe that home ownership in the GTA will remain affordable as borrowing costs stay low. The result could be a further increase in sales in 2014,” said Toronto Real Estate Board President Dianne Usher. “The average selling price will be up again in 2014 and by more than the rate of inflation. The seller’s market conditions that drove price growth in the second half of 2013 will remain in place in many parts of the GTA. Some neighbourhoods, especially those characterized by low-rise home types like singles, semis and townhomes, will continue to have less than two months of inventory,” said Jason Mercer, TREB’s Senior Manager of Market Analysis. The average selling price for December 2013 sales was $520,398 – up by 8.9 per cent compared to the average of $477,756 in December 2012. The average selling price for 2013 as a whole was $523,036, which represented an increase of 5.2 per cent compared to the calendar year 2012 average of $497,130.